It’s fantastic to see these two collaborate. Atif Aslam is extremely popular in Pakistan and after entering Bollywood, his popularity increased around the world. Having him enter the Islamic music scene is a real step forward for Islamic music, helping it reach new people. The track has been produced by Awakening Recods, one of the top record labels for Islamic music. Awakening are famous for promoting artists such as Sami Yusuf, Harris J and of course Maher Zain. 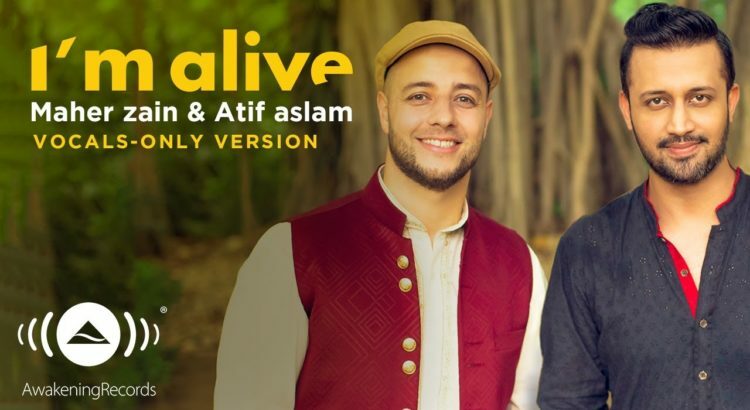 I’m Alive features on Maher Zain’s third album ‘One’ and includes a non-music version – like many of his tracks. The track focuses on the blessings of Allah and being thankful to him for giving us life. It’s refreshing to hear such an upbeat, joyful Nasheed. The video is set in Pakistan. It features Maher Zain wondering the Mosque before meeting Atif Aslam, the two then sing together. Check it out below. The MP3 is available on Amazon. Now onto the main part. Reviewing the lyrics with reference to Quran and hadith. Not only does Allah give us life, but he also promises to bring us back to life after we die. Interestingly, Allah uses the seasons to remind us of his power. He gives life to the plants during summer, causes them to die in winter, and brings them back to life again – a lesson to reflect on. When we hear about a disaster (such as the death of a loved one) we are taught to say “Inna Lillahi Wa inna ilayhi rajioon”. This means “To Allah we belong and to him we return”, we are essentially reminding ourselves that we indeed belong to him, he is our destiny. Keeping Islam in our minds all day can help us stay on the straight path, and also gain the help of Allah. Allah is one – known as the Shahada. This was also mentioned in the previous scriptures brought my Moses and Jesus (PBUT). This is one of my favourite tracks from the album. Not only is the track great but the video production is fantastic. I would love to see more of Atif Aslam in the nasheed industry, helping to promote a positive message for the youngsters of Pakistan and beyond. Leave your thoughts on the track below.